Sometimes ideas feel like they are burning a hole in my head. I get a sense of desperation when I have an idea and I fear I will forget it or lose it somewhere in my head. Most of the time I write it down in a notebook which I keep in my office. Lately I jot it into my phone as a memo. But, what do you do when it's 3am and you have a great idea? Is this why artistic and creative people are usually crazy? Because, frankly I think I'm losing my mind half of the time. I have said before how I love to quill. But I love a more modern feel to quilling. I mean, don't get me wrong, I LOVE flowers and prettiness but I also like crazy and funky. I usually delight in the brighter packs of quilling strip colors which many quillers stay away from. I just LOVE colors! I'm glad that quilling is making a huge comeback. Every day I seem to happen upon a new quilling blog or some amazing quilled creation on cyberspace. The best part is that I'm learning that you really CAN quill anything. It just takes a little time and some serious thinking but, hey I mean, I made Lady Gaga! Seriously?! 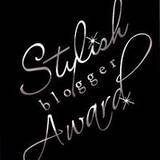 On another note, Cheryl of Cards by Cheryl nominated Sweet Spot for a blog award. How sweet its that? Who knew that Sweet Spot would be considered a "Stylish" Blog? Thank you to Cheryl and to all of you who read and follow my blog. And the squirrel is simply adorable. I love him!